Imperial reprisals have swept the galaxy, targeting not just the Rebels, but their families and loved ones as well. In desperation, you and a team of other Rebel operatives have gathered as many refugees as you can, in hopes of shepherding them to safety in the Outer Rim. Your escape is discovered, however, and you’ve crash landed on Tatooine. Here, the power of the Empire is not as strong as elsewhere—but that doesn’t mean you’re out of danger. This is the domain of Jabba the Hutt, and you’ll need to play by his rules if you want to survive. You and your Rebel allies have already survived in the lawless land of Tatooine once—and soon, it will be time to return to the realm controlled by one of the most vile gangsters in the galaxy. 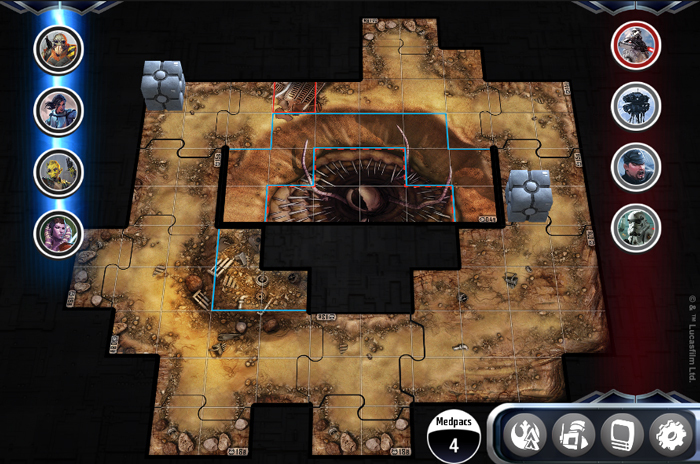 Fantasy Flight Games is proud to announce the upcoming release of the Jabba’s Realm digital campaign for the Legends of the Alliance companion app for Imperial Assault, available for free download on August 8! The Jabba’s Realm digital campaign is a retelling of the physical campaign found in Jabba’s Realm, but dives deeper into the vile gangster’s domain than ever before. 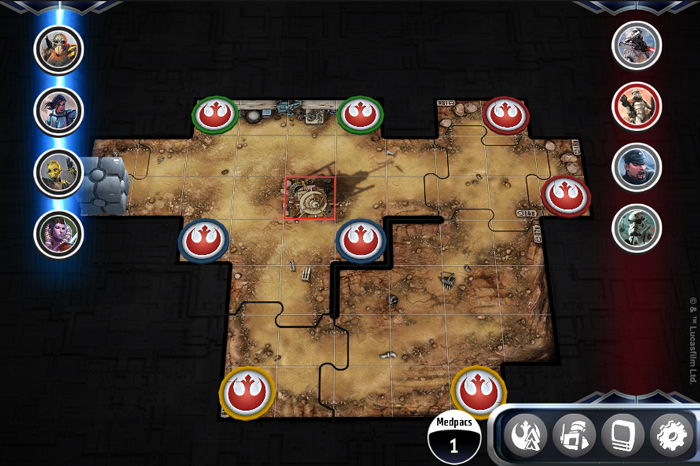 If you're unfamiliar, the Legends of the Alliance companion app is a free app that allows you to play Imperial Assault without the need for an Imperial player, letting you team up with three friends in campaigns unique to the digital app. Jabba’s Realm is the second free campaign, coming on August 8 to Legends of the Alliance. You can download the Legends of the Alliance app from the App Store, Steam, Amazon, or Google Play! today. The Jabba’s Realm digital campaign will see your heroes crash-landing on Tatooine, where they find themselves forced to serve Jabba the Hutt in order to protect the ones they love. This thrilling adventure takes you and your allies on five all-new missions that offer a new twist on the physical Jabba’s Realm campaign. 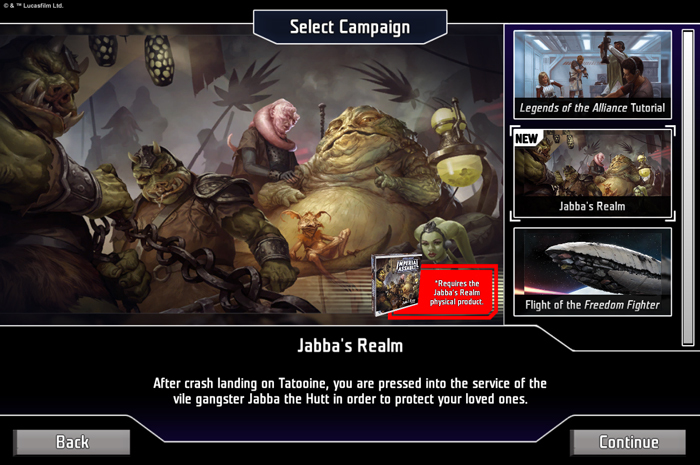 Though the campaign is five missions long, like the first campaign for the Legends of the Alliance companion app, the Jabba’s Realm digital campaign actually features eight new missions, offering plenty of replayability should you choose to dive into the world of Tatooine's scum and villainy once again. Although the narrative structure and story beats of these missions is similar to what is found in the physical campaign, the missions themselves are entirely new! You can still expect to see some familiar faces in your expedition to Tatooine. Your adventure will see you tangling with the dreaded rancor, Imperial leader Captain Terro, and of course, Jabba himself. You’ll need allies to survive in the desert wasteland, and the Jabba’s Realm digital campaign may see you teaming up with one of the most famous Jedi in the galaxy, Luke Skywalker! In this campaign, you can also look for brand-new story encounters, unique to Imperial Assault's digital campaigns, that will dive deeper into the story of Jabba’s Realm and provide new context for your team of brave rebels. These encounters fill in the blanks between missions, offering a text-based narrative that explores the quieter times of a campaign. These intermissions also offer choices to the players, and may even require their heroes to make some attribute tests. These story encounters add additional narrative depth to the campaign, and give you the additional choices to make the Jabba’s Realm digital campaign truly your own. Story encounters were first introduced in the first Legends of the Alliance campaign, Flight of the Freedom Fighter, but the ones found in Jabba’s Realm see players come face-to-face with the gangster himself! This app-supported campaign gives you the tools you need to experience Jabba’s Realm in a brand-new way. With the Legends of the Alliance companion app, your focus is directly on the action, and escaping the clutches of the vile Jabba the Hutt. Trapped in the lawless land of Tatooine, can you and your friends survive Jabba’s realm? Find out with the Jabba’s Realm digital campaign, coming to the Legends of the Alliance companion app for Imperial Assault on August 8!